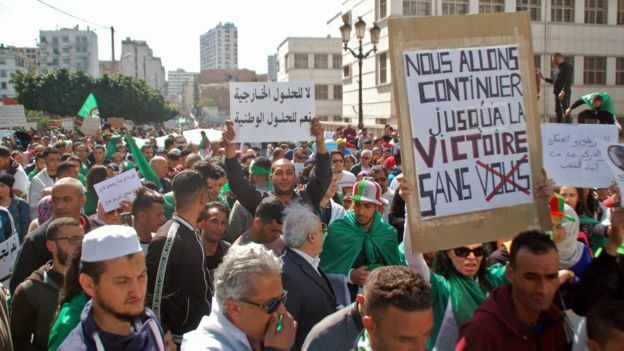 ALGIERS – Police and protesters have clashed in Algeria as marches against the ruling elite show no sign of ending. BBC reports that Police used water cannon and tear gas in the capital Algiers as demonstrators called for the removal of new interim President Abdelkader Bensalah. Mr. Bensalah will be in office for a 90-day period as set out by the constitution and is barred from running in the upcoming poll, but demonstrators are still demanding his resignation. On Wednesday, the country’s army chief, Lt Gen Gaid Salah, made his first public address since Mr. Bensalah’s appointment. Mr. Bouteflika was considered by many as being a front for a group of businessmen, politicians and military officials who were said to really control the country.